There are 3 cards that travellers can use in Singapore: Singapore Tourist Pass, EZ Link and Standard Ticket. Each has its own pros and cons, and each is suited for different types of travellers. In this post, I write about the details of each card, followed by situations when a certain card is more favourable than the other. 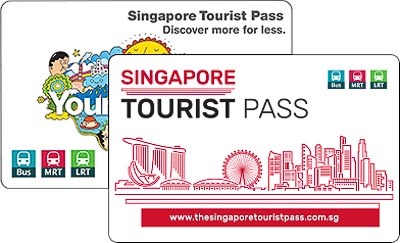 The Singapore Tourist Pass (STP) is a card that gives you unlimited travel on Singapore’s MRT, LRT and basic bus services for 1 day, 2 days or 3 days depending on which pass you purchase. The STP costs S$10 for 1 day, S$16 for 2 days and S$20 for 3 days. A deposit of S$10 is required when purchasing the pass. The deposit will be refunded when you return the card within 5 days after the day of purchase. Eg: If you purchase the card on Monday, you need to return the card by Saturday to get the deposit back. In other words, if you buy the 3-day pass, you need to activate it latest by Wednesday. If you decide to keep the card and not return it, the S$10 deposit will be forfeited, and you can continue to use the card as a normal EZ-Link card. Kids below 0.9m height travel for free on trains and buses when accompanied by a fee-paying adult. 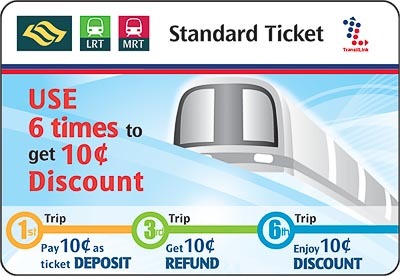 You can buy STP at TransitLink Ticket Office located at certain MRT stations: Ang Mo Kio, Bayfront, Bugis, Changi Airport, Chinatown, City Hall, Farrer Park, Harbourfront, Jurong East, Kranji, Lavender, Orchard, Raffles Place, Somerset, Tanjong Pagar, Woodlands. More details on opening hours here. When purchasing STP, not all TransitLink Ticket Office accepts payment by cards. The selected TransitLink Ticket Offices that accept MasterCard and JCB payments are located at Bayfront, Bugis, Changi Airport, Chinatown, City Hall, Farrer Park, HarbourFront, Lavender, Orchard and Woodlands MRT Stations. SMRT Passenger Service Centres located at MRT stations at Changi Airport, Kranji, Lavender, Dhoby Ghaut and Marina South Pier. Unlimited rides applicable for: MRT, LRT and basic bus services. Unlimited rides are not applicable for: Sentosa Express monorail, RWS8 bus, Express Services Bus, Fast Forward Bus, Night Owl bus (N bus), NightRider bus (NR bus), Chinatown Direct bus (CT bus) and other premium and niche bus services. The pass starts when you use it for the first time. The 1-day pass ends when the last public transport has stopped operation (slightly past midnight). Eg: if you use the card for the first time at 6pm on Monday, the 1-day pass will expire on Monday’s night (when the last train and bus have stopped), the 2-day pass will expire on Tuesday’s night and the 3-day pass will expire on Wednesday’s night. Now, STP offers various deals, from discounted attraction prices to discounted meals. 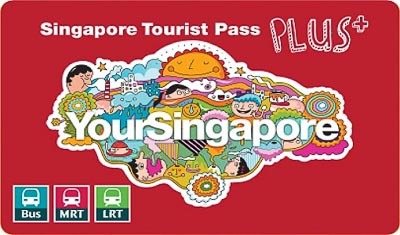 The Singapore Tourist Pass Plus (STP+) is an extension from STP. On top of unlimited rides on trains and basic bus services, STP+ offers additional perks. The cost of STP+ depends on where you buy it from. At the moment, it’s sold at Changi Recommends. You can buy it online and collect at the airport, or directly buy from Changi Recommends’ counter. There isn’t any S$10 deposit required. It costs S$38 for 3 days. Should you get Singapore Tourist Pass Plus? Is STP+ worth it? In my opinion, STP+ is worth it only if you’re interested to join the free half-day tour and dine at Hooters. If you’re the type of traveller who loves to DIY your travel and would avoid tours as much as possible, or if you’re a budget traveller or slow traveller, you can skip STP+. EZ-Link card is the most commonly used travel card by residents and returning visitors. In the beginning, you store a certain value inside the card. Your card’s value will be deducted only when you use it. The price of an EZ-Link depends on where you buy it from. If you buy from TransitLink Ticket Offices, Concession Card Replacement Offices and Passenger Service Centres located at all MRT stations, it costs S$12 which consists of S$7 value + S$5 non-refundable deposit. If you buy from 7-Eleven, it costs S$10 which consists of S$5 value + S$5 non-refundable deposit. You need to maintain a minimum $3 balance in your EZ-Link in order to be able to board MRT and buses. Minimum top-up amount is $10. IMPORTANT: with the initial credit of $7, you can only take public transport for about 3 times (assuming $1.5/ride), then your credit will be below $3 (you need to maintain at least $3 in your EZ-Link). You have to top-up before you can use the card again. The minimum top up is $10. Therefore, your total cost becomes $12 + 10 = $22. So, if you come for only 3 days or less, I will not recommend you to use EZ-Link. You can return EZ-Link to any Passenger Service Centre at MRT stations, Ticket Office at MRT stations, Ticket Office at bus interchanges, and receive the refund of the unused value. However, you can’t get back the S$5 non-refundable deposit. EZ-Link can be used at MRT, LRT and most public buses. Furthermore, you can also use EZ-Link for SMRT & TransCab taxis, F&B outlets, and many places you can’t even imagine. Here’s the full list of places where payment by EZ-Link is accepted. For simplicity, just look for EZ-Link logo at the shop where you’re going to make payment. If there’s EZ-Link Logo, it means you can use EZ-Link to pay. EZ-Link is valid for 5 years from the date of encoding. At the end of 5 years, you can exchange the card at Ticket Office. EZ-Link cards can be reloaded (topped up) at all General Ticketing Machines at all MRT Stations, certain bus interchanges, 7-Eleven, ATMs, and other places. Here’s the complete list of places where you can top up your EZ-Link. You can store a maximum value of S$500 in the EZ-Link. You can download EZ-Link app to check your current remaining balance, transaction history, as well as to earn points that you can use to redeem freebies or discounted items! If you haven’t heard about NETS FlashPay, it’s basically similar to EZ-Link. They cost the same, $12 for the first purchase ($5 non-refundable and $7 refundable). It can be used for public transportation, taxi as well as F&B, retail shops, etc. You can top up via app (with debit/credit card) or by other offline means such as the General Ticketing Machine (GTM) located in every MRT stations, 7-Eleven, etc. So, is there any difference with EZ-Link at all? Yes there is. The company that issue them are different. 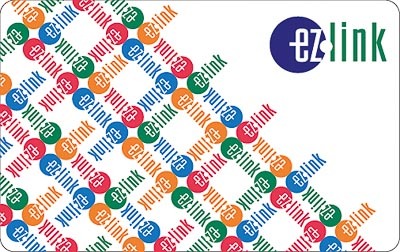 EZ-Link was started by Authority while NETS was started by a group of banks in Singapore. Another difference is the merchants that accept EZ-Link are different from the retail merchants that accept NETS FlashPay. 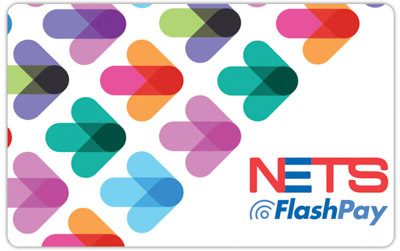 Personally, I feel that I see more NETS FlashPay logo in the shopping malls than EZ-Link logo. So, why even bother to get NETS FlashPay? Well, if you like the idea of carrying not much cash (notes & coins) around, or you like to be able to collect it from your country’s airport or sent to your home (see below), then you can consider NETS FP. Where to get NETS FlashPay? Pre-order online and collect at Singapore’s Clarke Quay (check the operating hour), Malaysia’s KLIA, Thailand’s BKK Airport, or mailed to your home in Indonesia, Philippines, Vietnam or Taiwan. TransitLink Ticket Office. Note: A lot of MRT stations have a TransitLink Ticket Office, but NOT ALL MRT stations have TransitLink. Changi Airport MRT station does have TransitLink Ticket Office. Travelex Moneychangers at Changi Airport. A standard ticket is a single-journey ticket. Most people use this because they don’t like to commit to STP or EZ-Link, or they forget to bring their own EZ-Link card when they go out. A Standard Ticket can be used for MRT & LRT only, not bus. A Standard Ticket costs the single journey fare + S$0.10 deposit. Standard Ticket can be re-used up to 6 times within 30 days. It can be purchased from any General Ticketing Machine at all MRT/LRT stations. After you pay for a trip, you need to travel on that day. It can’t be used on other days. If you don’t use the trip that you’ve paid, you can request for the refund within 3 days from the date of purchase from Passenger Service Centre in any MRT station. If you travel further than what you have paid, you need to approach the Passenger Service Centre to top-up the fare difference before exiting at your new destination. The fare is considerably higher than EZ-Link’s fare. When should you buy Singapore Tourist Pass? You want to visit a lot of places. Buy 1-day STP if you use public transport more than 7 times a day. Buy 2-day STP if you use public transport more than 6 times a day. Buy 3-day STP if you use public transport more than 5 times a day. You don’t need the cab, you’re comfortable with using public transport. You don’t know when you will visit Singapore again. When should you buy EZ Link? You use public transport less than 5 times a day. You visit Singapore for more than 3 days. You are a budget traveller and you don’t mind walking or cycling to save money. You travel slowly. In a day, you might be visiting less than 3 attractions. You come to Singapore often and you’d like to keep the EZ link card so you don’t have to purchase again when you come next time. When NOT to buy STP & EZ-Link, and just buy a Standard Ticket for the train and use cash for the bus? You use public transport less than 3 times a day. You have a local friend who can drive and bring you around Singapore for free. You use cab more frequently than public transportation. You’re on a transit, or you are in Singapore for a short period of time. You’re not doing too much sightseeing. You don’t have any plan to come back to Singapore in the near future. How to find out the fares? The easiest way to calculate the public transportation fare is by using the calculator provided by MyTransport.SG. For your info, if you use EZ Link and you make a transfer from train to bus, bus to train, or bus to bus, within 45 minutes, you will pay for discounted fare due to the new “distance fare scheme.” You don’t need to do anything, it’s automatically adjusted by your EZ Link. Disclosure: Some links on this post are affiliate links; I would receive a commission when you booked through my links, at no extra cost to you. Hi Eva, thanks for this helpful article. Another variation of this question. So STP has refundable deposit of S$10 when you return the card. EZ-link has non-refundable deposit of S$5 and you must keep the card, and EZ-link will let you cash out whatever is remaining on the card (not including the S$5 deposit). Let’s say I buy STP card, use it until it expires (after 1, 2, or 3 days), and then it converts to EZ-link, and I top up with S$20. Then I use about $15, leaving $5. So when I return the card, do I get $10 refundable deposit + $5 cash back for the unused portion of my top up? Thanks. Yes let’s say i return the stp card within the 5 days. Will i get both the $10 back AND the $5 thats remaining on the card? Hi Tracy, according to EZ Link hotline, yes you can get $10 deposit plus unused EZ Link value. Hello, we will arrive in Singapore on August for 5 days. We are a family of 4 ( 2 adults and 2 children 10 and 15). We want to visit and explore as much as the time will permit. I need your advice … Except the days that we will be in the same place all day long (Sentosa) (Gardens by the Bay) it is better to buy 4 STP or 4 Ezlink or to use Grab or Taxi? Hi Dimi. Since you allocate 2 days for Sentosa and Gardens by the bay, you now have 3 days to explore the rest of Singapore. Because you want to visit as much as you can, I think you can consider STP, especially if you think you will take public transport more than 5x a day. However, if you don’t think you will take public transport more than 5x a day, because the places you will visit are located near each other (within walking distance), and you have more budget, grab/taxi is a good option. But please note that grab/taxi in Singapore can get expensive during peak hour due to additional surcharge or high demand. EZ-Link is only a good option if you will come back to Singapore again within 5 years because it expires after 5 years. We’ll arrive by Royal Caribbean cruiseship on 6 Sept at 8 am at Marina South Cruiseport. Our flight for Canada is at 6.30 am on 8 Sept. So we will be in Singapore from 6 Sept until nighttime of 7 Sept, as will be staying at the airport for the night of 7 Sept.Our one night hotel is at Bugis. We will be very obliged if you can kindly advise us what kind of tourist pass we should get as we would like to explore Singapore as much as possible for the 2 days. 1. It seems we cannot get the 2 day tourist pass at the Marina South MTR. So do we pay cash at MTR to get to Bugis, then get the 2 day tourist pass when we get to Bugis? How much cash do we need and does the machine accept cash? or is there a better way? 2.how far is the cruiseport to Marina South MTR? is it walking distance?is there a free shuttle to the MTR? 3.can that 2 day tourist pass allow us to go to airport? If you’re going to explore as much places as possible, the STP is the best card for you. 1. Yes, you need to purchase Standard Ticket (1 way travel) to take MRT from Marina South Pier to Bugis. It can be purchased from the machine, the counter doesn’t sell it. I suggest before you purchase the Standard ticket, you can check with the counter whether they sell STP (in case they have changed the rule and now sell at Marina South Pier). The price should be about $2 per trip per person. Yes they accept cash, and they can give the return as well. 2. The Marina South Pier MRT station is within walking distance from the cruise port. I don’t think there’s a shuttle bus. 3. Yes the 2-day pass allows you to take MRT to airport as well. 4. Yes, you can get back the $10 deposit at Changi Airpor’s Transit Link office (opening hour is 8am to 9pm), or Passenger Service Centre (operating hours is the same as MRT operating hour (about 6am-12 midnight). Hope it helps! Hope you have a good trip in Singapore! I have a 9 year old daughter. Does she also need EZ link card and will it be full fares for her too in all public transport options. Me and my pregnant friend are actually planning to visit SG this August 4 to 8 and KL August 9. I really need your help so I can finish my own itinerary. August 5 (Universal Studios $ Sentosa), August 6 (Marina Bay Sands, Merlion, Gardens by the bay, singapore river, cavenagh bridge, and more) August 7 city tour, go to Legoland and KL. 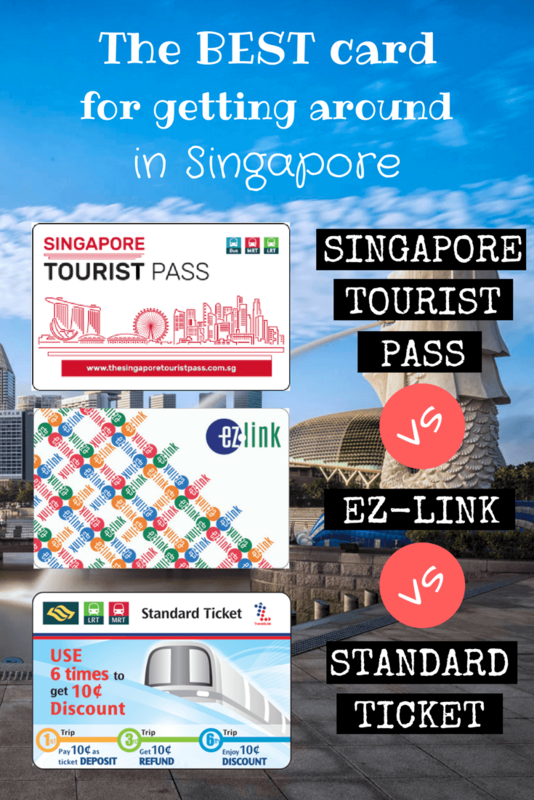 – Which card should I use (EZ link or tourist pass)? 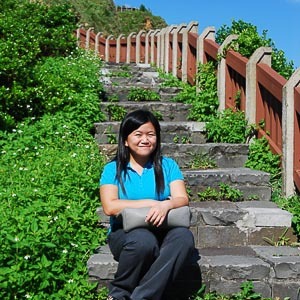 hi,,,iam so glad to find this blog, as i have planning to visit SG at this Sept,i have some problem to manage my itinerary,,,i hove you mind to answer my question. it’s about 3-day stp card, if i buy the card at sunday night, and i’ll use the card start at monday morning, does it mean that the card will valid until wednesday night? Hi Ima, yes, if you start using it on Monday, it will be valid til Wednesday night. hello Eva I read somewhere that EZlink card charges (travel charges) are lower than the STP travel charges is it true? Hi Amit, EZ-link charges per trip, while STP charges per day. So, they can’t be compared directly. Hi Eva! Your blog is very informative, and you totally hit the points that are important. I just have a question. I am a returning tourist who have already bought a STP last May 2018. I will be visiting SG again this coming October and i’m just wondering if I can still use my existing STP and load it up for 3-day unlimited STP? I will be staying for 5 days. Arriving at Saturday night and leaving at Wednesday noon. So my plan is to avail 3-day unlimited STP that I will use from Sun-Tue, and at the same time buy an EZ-Link card for my Sat and Wed commute. 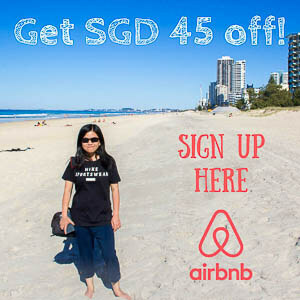 Hope you can help me experience the best of SG! If you’re not a heavy user, just use your own card as a normal EZ-Link card. Hi Dipak, first of all, you and your wife can’t share a card. Each of you needs to have a card on your own. Since you’re only visiting for 3 days, I suggest that you get STP. If you’re using standard ticket, each trip would cost at least $2 (std tix is quite expensive), so 9 trips will cost at least $18. A 3-day STP costs $20 and gives you unlimited MRT and bus rides, so I think you’re better off getting 2 nos of STP. Thanks for a well-informed blog. I would like to know if you can use VISA (besides MASTER) to pay for the STP. Awesome, thank you for the detailed info, it helped quite a bit. i will go to singapore with my sister for 3 days. can we share Ez-link? Hi Mary, it’s not possible to share EZ-Link. so we have to buy 2 for both of us..
1. Singtel launched a new $18 hi!Tourist EZ-Link SIM Card which is a 2-in-1 Tourist SIM and EZ-Link travel card. Will it be available at Changi Airport T3? 2. Since this card validity is 7 Days and my stay in Singapore is for 9 days, is it possible to extend the expiry of this card with for additional 2 days? 1. Sorry, I’m afraid I can’t advise. This is a fairly new card so there’s not much info about this. I suggest that you try to visit Travelex Currency Exchange or Changi Recommends at Terminal 3 and ask them. 2. Technically, you can extend Singtel Tourist SIM by topping up ($3 will gives you additional 1 day). thank you so much or your detail information. so, children below 7 years old can enjoy free travel using MRT and bus? I read that although it is free, children need Child Concession Card. Where can I get it? and I need your suggestion about my itinerary. should I buy ez link or STP? You may refer to this rule about child fare. If your child is below 0.9m in height, there’s no need to apply for Child Concession Card. You can apply at any TransitLink Ticket Offices. To answer your second question, it depends whether you visit other places in addition to those you mentioned, whether you plan to come back to Singapore again in the future. A general rule I often recommend to others is that if you visit Singapore for 3 days or less, it’s usually better to buy STP. But if you really only visit 1 place a day (means 2 rides a day), it’s better to just use Standard ticket. iya. Eh kamu Indo juga, tho. so, lebih baik STP saja ya untuk dewasa. Anak saya tingginya udah 90 cm lebih so minta Child Concession Card. Gitu ya? keluar T4 saya langsung ke Changi Recommends karena letaknya strategis banget. Di sana tidak menjual STP, hanya EZ Link S$10 dan STP+ S$38 non-refundable. Ternyata simple, kalau tetap mau beli STP ya ke ticketing office di MRT Station. Antreannya bisa panjang lho untuk ini. Unfortunately you can’t use 1 STP for 2 people 🙂 Each person must have his/her own card. Hope you have a good trip next week! last month i went to SG. and i would like to go there back this August.. can i use Ez Link that i bought last month for my next travel? Yes, it’s valid for 5 years from the date of encoding. We’re coming for 5 nights and won’t take too many trips a day. What card do I get if it’s a return journey (2 trips)? Does distance matter? And what if we take 3 trips a day? Assuming a trip is whenever I get on the train until I get off. Also assuming exchanges don’t count as separate trips. Hi inesa, you mean 2 trips per day or for the whole trip? For your case, it’s not worth buying STP because you don’t travel much. If you’re travelling 2 trips for the whole trip, then it’s better to get standard ticket. But if it’s 2 days per day, I recommend you to get EZ-Link. For 3 trips per day, I also recommend EZ-Link. Yes, distance matter in calculating the fare, but not so much in choosing which card to use. Hi Ridzuan, if you’re not planning to come back to Singapore in the foreseeable future, yeah 2-day STP plus standard ticket would be the best way. To buy standard ticket from Lavender, just go to Lavender MRT, there are ticketing machines near the scan card gate. Just choose your destination (which is Changi Airport), then pay by cash. Change will be given, so it’s ok if you pay with bigger notes. Besides using STP for travel would like to avail discounts on the tickets of these attractions. Is that possible n how do I buy discounted tickets? Q what is the validity period of the card? Q does it include food? Q is the Amazon rainforest boat cruise included in the pass fee? No, STP doesn’t give complimentary tour, only STP Plus does. Yup, STP+ also gives discounted tickets, you can read more in my article, in STP+ section as well as Changi Recommends website. Are you referring to Park Hopper for WRS? You can refer here for details. It’s valid for 7 days. There are many types of park hopper. If your tix includes river safari, then you can get complimentary reservoir cruise. Thank you so much Eva. I wish to buy STP for 3 days will I get discount on Sentosa attractions..
Q1 what all attractions will give discounts on tickets..
Q2 also as my parents are senior citizens will they have a different and cheaper entry tickets..
Hello! Your blog is very informative. We are going to SG this July. I will be with my parents on the trip. My question is do we have ro buy ez-link cards individually or can we just share the single card and just top it up with more value? I hope you can help me with this. Thank you. More power. Hi! Yes, you need one card for each person 🙂 No sharing is allowed. Happy trip planning! I have learned on Singapore more from your website than the sum of all the other websites. Thank you very much. I am most grateful. Please note than your sentence above “Personally, I feel that I see NETS FlashPay logo in the shopping malls than EZ-Link logo.” is missing the keyword “less” or “more”. Is ez-link widely accepted at Food Centres? Hi Francis, Thank you so much for pointing it out to me! I have totally overlooked that part. It should be “more.” EZ-Link is accepted at food centres however not all stalls will accept it.